Cancer- the “Healthy Cell” Solution Part 1. Cancer is NOT a DEATH SENTENCE ! This Blog Post is Part 1 of a series of 23 Posts that will be posted over the next few weeks. The “Healthy Cell” series is a comprehensive, all inclusive unique “Ultimate Health and Wellness” series focusing on practical ways to prevent or heal all diseases, especially cancer. Whats covered in this Series ? In this series you will find out why “healthy cells” are so important and what the 4 unique key factors are that are required to keep them healthy ? You will also find out about the 6 critical things you need to do in preparation for implementing the 4 Unique Healthy Cell factors. You will also be introduced to the 2 most critical “health” success factors required when you plan your “health and wellness” journey. 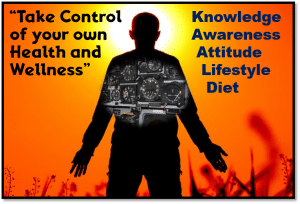 Very few people realise how important it is to “Take Control of Your Own Health and Wellness” when it comes to managing their own health and wellness and to focus on these 2 critical success factors. You MUST be aware of your options and have true factual information as well as the very best available toxin free products to be successful by addressing these 2 critical requirements. Best effective, scientifically proven supplements and super-foods with a track record. Finally you will get access to the most comprehensive “health and wellness and healing” website that is jam packed with hundreds of pages of FREE information from a leading Doctor who is a natural alternative health expert with over 20 years experience helping millions of people to prevent and heal all kinds of disease and live an active, long and healthy life. In addition, to overcome cancer I know that taking the very best supplements and superfoods is absolutely critical, so I have searched all over the world to find the very best range of highly effective, toxin-free products that have a proven track record, for myself, my family and for all my readers and followers. This Blog Post series is based on the “Healthy Cell” Concept originally developed by Dr A Carter and applies to all diseases and not just cancer. 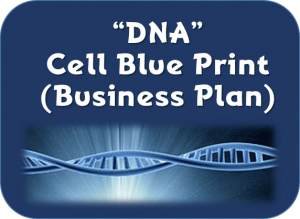 The miracle of life starts with a single cell that has a DNA with a perfect blue print of every aspect of what your future body is going to look like. The color of your hair, eyes and skin, how big your bones are going to be, how tall you will be, how smart you will be, etc. 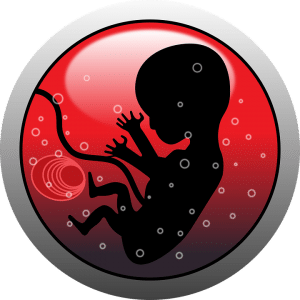 As you grow in the foetus (fetus) and go through the birth, this single cell duplicates itself exactly over and over so that when you are about 3 months old you will have 100 trillion cells (including bacteria cells) all derived from the original cell. Stop to think about this for a moment- every feature of your body was formed from ONE cell and created 100 trillion cells making up your body – WOW !!!! that is a miracle, especially because each cell is actually modified for a specific task. There are over 200 different cell types that make up the organs, eyes, bone, skin, hair, tissue, muscles, etc. Each cell is a mini-factory with a specific job and a predetermined life span. It is important to note that every cell is being replicated on a regular basis. All “healthy” cells are like factories which have certain facilities and carry out certain activities. A “garbage” removal system – the lymphatic system removes all cell waste, toxins and poisons from the body including the cells that die naturally. Although the body is extremely intelligent it does make malformed (mutant/malignant) cells which are usually caused by toxic chemicals including carcinogens like chemotherapy (all prescribed drug medication have toxic chemicals), radiation, free radicals, ultraviolet rays from the sun, polluted air and water, toxic food and drink from processed foods, chemical fertilizers, pesticides and herbicides, GMO grain, oils, fruit and vegetables, and normal waste byproducts from the cell factories, if not removed. These cells will either be repaired by the DNA in the cells or if they become cancerous, a healthy immune system, which is the bodies’ highly effective and intelligent defense system, will kill these cancerous cells and they will be eliminated from the body. As a matter of fact every one of us have about 10,000 cancer cells in our bodies at any point in time which is a natural occurring condition in all of us. Fortunately while the immune system is “HEALTHY” it identifies these mutant cells and kills them so that we don’t all get cancer. However if the body becomes so toxic and acidic from all the toxic acidic chemicals and poisons that we are exposed to and consume in the modern world of convenience fast fried foods and boxed, bottled and packaged processed foods that overwhelm and destroy the immune system, then cancer cells multiply freely and we get cancer. We have just seen that when the body becomes overloaded with toxic acidic chemicals and poisons then the immune system gets overwhelmed and destroyed and it can’t do its job properly and cancer forms. SO!!!! 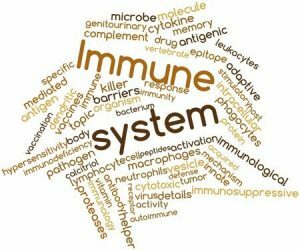 From this it is obvious that “Cancer is a symptom of an inefficient immune system”. It is also important to note that cancer is caused by an accumulation of these malignant cancer cells which can ONLY happen when the Immune system is incapable of destroying these malignant cancer cells. It is also important to remember that cancer is caused in ALL cases by the mutation of individual cell genes that accumulate over many years if not the immune systems is degraded. Depending on which part of the body the cells are located, that is how “modern conventional medicine” name the cancer, thus creating over 100 different types of cancer. This is particularly convenient for the Pharmaceutical companies who can treat each of these cancers differently with their own in-effective, toxic and highly profitable, patented chemical drug medication. Most of the cells in the body are being continuously replaced other than the “central nervous system” or the eye lens cells. The rate of replacement varies from a few days like the stomach cells to 2 weeks for bone cells, 4 months for the red blood cells and 8 months for fat cells. 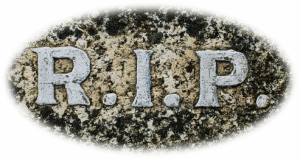 The dead cells are “vacuumed up” by the lymphatic system and eliminated from the body together with other toxins and poisons. It is also important to note that the amazing body has the ability to heal itself as long as every factory (cell) gets oxygen and the right “cell food” (nutrition) and exercise, and not flooded with toxins or poisons. The body, fortunately can also regulate itself as part of the healing process through a whole range of control mechanisms and homeostasis. Homeostasis refers to the stable state of a cell and its internal environment by balancing the bodies control mechanisms within pre-set limits. These include, amongst others, body temperature, fluid balance, concentration of calcium, sodium and potassium ions, the ATP generated by each cell, blood sugar levels, bile acids in the liver, the control of trace minerals and proteins, the release of hormones, the control of the breathing, the levels of oxygen and removal of carbon dioxide, the filtering of both food and drink that we eat, the elimination of toxic acidic chemicals and poisons and the very critical control of the pH of all bodily fluids. 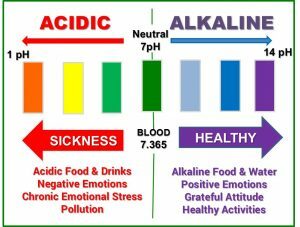 Other than the stomach acid the blood pH is stringently controlled at 7.365 and most other body fluids need to be maintained in a slightly alkaline state as well. “The body is alkaline by design, but acidic by function.” So noted Nobel Laureate Albert Szent-Györgyi, the scientist who discovered vitamin C. This often quoted one-liner refers to the fact that most of our body’s physiological functions require a slightly alkaline environment for optimum functioning. It has been scientifically proven that all modern chronic disease is caused by “acidosis”. It has also been proven that cancer cells cannot spread or live in an alkaline environment. Our bodies pH is affected negatively by the acidic food we eat and drink and also by fear, anger, a negative mindset and chronic stress. However it is positively affected by a positive, happy, compassionate and grateful mindset. How do we ensure we have ultimate health and wellness and prevent or heal modern chronic diseases like cancer, dementia, obesity and stroke / heart attacks? For the body to be ultimately healthy, every cell in the body and especially the Immune System cells must be healthy. To achieve this Dr Carter devised the “Healthy Cell” concept over 20 years ago that has been proven to be highly effective. The natural “Healthy Cell” concept consists of 4 contributing factors that you can control by the lifestyle choices you make. This requires you to take control of your own health and wellness and NOT rely on conventional health practitioners who mostly do NOT understand or even know anything about acidosis, alkalinity, nutrition or that this “Healthy Cell” concept exists. They are mainly forced by the conventional medical fraternity and the Pharmaceutical companies to only use prescribed, expensive patented toxic chemical drug medication like toxic chemical chemotherapy. It is important to understand that these 4 contributing health factors are integrated and all 4 are required to be functioning optimally to achieve healthy cells and therefore a healthy body. It must also be understood that the “healthy cell” treatment is only one part of a successful Cancer Healing Program. Cell Exercise – cells make up all muscles and tissue and organs which all benefit from a very specific exercise called rebounding. Jumping up and down against the force of gravity not only stimulates the lymphatic system and the immune system but also conditions every cell in the body. 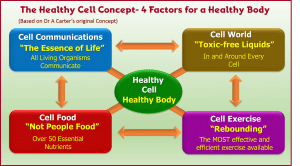 Before we can start addressing the 4 “Healthy Cell” Factors we need to prepare the body with 6 critical activities to ensure the body will be ready to maximize the benefits of the 4 “Healthy Cell” Factors. In the next Post I will introduce these 6 critical preparation activities. 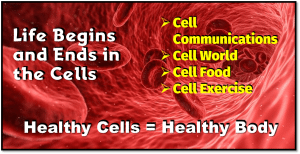 I hope you have found this introduction to the “Healthy Cell” concept interesting and informative. In the next post I will be introducing the 6 critical preparation activities which will ensure that the body will be ready to maximize the amazing benefits of the 4 “Healthy Cell” factors that will enable you to achieve ultimate health and wellness in the future. Be sure to visit soon so you don’t miss this important information to ensure you are on the “health and wellness” journey. Until next time – Best wishes, stay happy, positive and grateful. Hello outstanding website! Does running a blog such as this require a great deal of work? I’ve no knowledge of coding but I was hoping to start my own blog soon. Anyways, should you have any recommendations or tips for new blog owners please share. I know this is off topic nevertheless I simply wanted to ask. Thanks a lot! I pay a quick visit day-to-day a few web pages and information sites to read content, except this weblog presents quality based content. You can nott imagine simply how so much time I had spent for this information! Thanks! My family all the time say that I am wasting my time here at net, however I know I am getting knowledge daily by reading thes nice content. Great goods from you, man. I have understand your stuff previous to and you are just extremely excellent. I really like what you’ve acquired here, certainly like what you’re stating and the way in which you say it. You make it enjoyable and you still take care of to keep it smart. I can’t wait to read much more from you. This is really a wonderful site. Greetings from Idaho! I’m bored to death at work so I decided to check out your blog on my iphone during lunch break. I really like the information you provide here and can’t wait to take a look when I get home. I’m surprised at how fast your blog loaded on my cell phone .. I’m not even using WIFI, just 3G .. Anyhow, amazing site! Hi there to every single one, it’s really a pleasant for me to visit this site, it contains important Information. back to read a lot more, Please do kedp up the awesome work. was once entiely right. This post actually made my day. There is certainly noticeably a fortune to understand about this. I assume you made certain nice points in features also. Howdy, You’ve got done a wonderful job. I will definitely delicious the item and also on their own recommend so that you can my girlfriends. I am sure they shall be took advantage of this blog. hi!,I love your writing very much! share we keep in touch extra about your article on AOL? I need an expert in this area to solve my problem. Maybe that’s you! Looking forward to peer you. Do you mind if I quote a couple of your posts as long as I provide credit and sources back to your website? My blog is in the very same area of interest as yours and my visitors would truly benefit from some of the information you provide here. Please let me know if this okay with you. Regards! Thanks , I’ve recently been looking for information about this subject for ages and yours is the greatest I have discovered so far. However, what about the bottom line? Are you certain in regards to the supply? Simply want to say your article is as astonishing. The clearness in your post is just spectacular and i could assume you are an expert on this subject. Fine with your permission allow me to grab your RSS feed to keep up to date with forthcoming post. Thanks a million and please continue the gratifying work. Also, The contents are masterwork. you have done a great job in this subject! of course like your web site however you have to check the spelling on quite a few of your posts. Several of them are rife with spelling problems and I to find it very troublesome to tell the reality nevertheless I’ll surely come again again. What’s Going down i’m new to this, I stumbled upon this I have found It positively useful and it has aided me out loads. I hope to give a contribution & help different users like its aided me. Good job. Woah! I’m really digging the template/theme of this website. It’s simple, yet effective. A lot of times it’s difficult to get that “perfect balance” between usability and appearance. I must say that you’ve done a great job with this. Additionally, the blog loads very quick for me on Firefox. Excellent Blog! I really wanted to post a brief comment in order to express gratitude to you for all the awesome steps you are showing on this site. My considerable internet search has at the end of the day been paid with high-quality details to talk about with my visitors. I would repeat that most of us site visitors are quite fortunate to be in a fabulous website with many lovely professionals with insightful tips. I feel very blessed to have discovered your web pages and look forward to tons of more cool times reading here. Thanks a lot once more for everything. I want to show my gratitude for your kindness giving support to visitors who require assistance with your niche. Your personal commitment to getting the solution all-around had been exceedingly beneficial and has in most cases made folks much like me to reach their pursuits. Your new insightful instruction entails a lot to me and much more to my mates. With thanks; from all of us. My husband and i were absolutely joyous when Peter could finish up his studies through the ideas he gained while using the web site. It is now and again perplexing to just always be giving for free techniques people today might have been trying to sell. We realize we have you to give thanks to for this. All the explanations you have made, the simple blog menu, the friendships you will aid to engender – it is everything excellent, and it’s really aiding our son and the family imagine that that concept is fun, which is truly fundamental. Thank you for the whole lot! I want to voice my passion for your kind-heartedness for all those that absolutely need help on this particular situation. Your very own dedication to getting the message across ended up being especially valuable and has truly helped folks just like me to achieve their objectives. The helpful help can mean so much to me and further more to my office workers. Regards; from everyone of us. Thanks a lot for providing individuals with a very splendid possiblity to check tips from this website. It’s usually very awesome and as well , full of fun for me and my office friends to search your blog no less than three times in one week to read the newest stuff you have. Not to mention, I am certainly satisfied with your remarkable knowledge you give. Some 3 facts in this post are in reality the simplest I’ve had. nike air max 2017 on Cancer- the “Healthy Cell” Solution Part 1. Sebastian Adaway on Cancer- the “Healthy Cell” Solution Part 1.
goyard handbags on Cancer- the “Healthy Cell” Solution Part 1.
adidas yeezy on Cancer- the “Healthy Cell” Solution Part 1. Men HI Star Sneakers on Cancer- the “Healthy Cell” Solution Part 1. Enter your name and email to get the monthly Cancer Buddy Lifestyle newsletter... it's FREE! Packed with interesting cancer survival, lifestyle, health and wellness information as well as bargains from the Organic Lifestyle Portal and the Global Shopping Mall. Your information is totally secure and will *never* be shared or sold.